Every job involving a support vehicle has its own special needs, and Syncro installers see proof of this every day, whenever a new customer comes in to explain his requirements and state the model of van for which racking is needed. 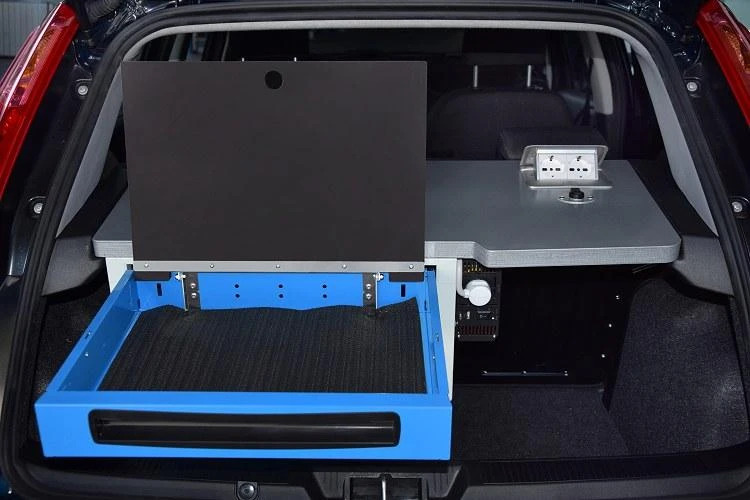 This page illustrates a special racking system designed for everyday use by a mobile police unit. 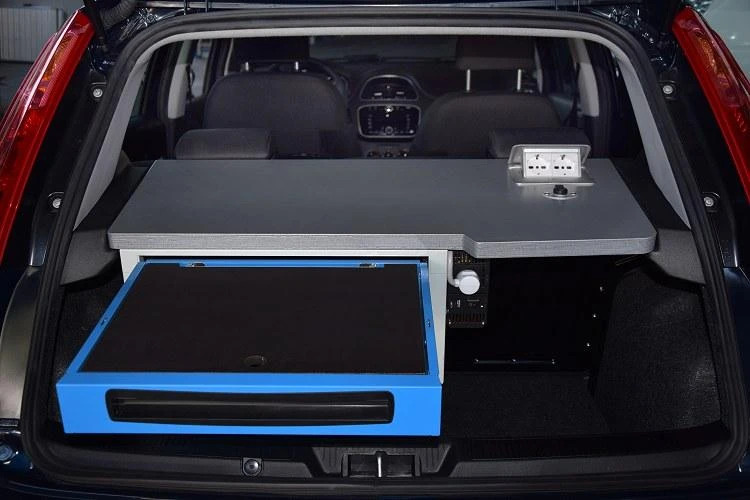 In this case, the vehicle is a Punto Van, a compact car in which the space normally occupied by the back seats, along with the boot area, can form a load compartment large enough to house a small racking system. an autonomous electricity supply to avoid running down the van’s own battery. The racking installed in this Punto Van is simple but functional. It consists of a two-drawer metal cabinet in which the top drawer is fitted with a fold-up writing board. 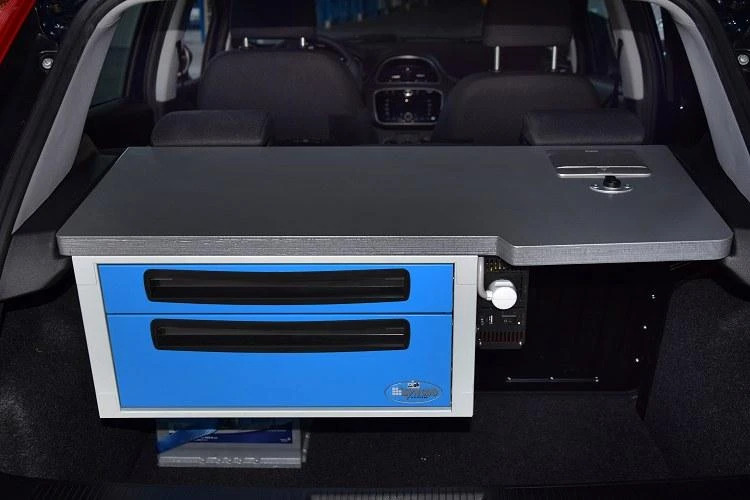 This is a great way of providing a stable, flat surface for filling in forms, checking documents, or even using a laptop computer or tablet wherever the van is stationed. The resinated wood writing board is secured to the drawer by hinges. A round hole is located at the front of the board so that it can be lifted up to provide access to the contents of the drawer. The drawer itself is fitted with a rubber mat, and is large enough to hold all the stationery, notepads and documents needed by the officers. The rubber mat inside all Syncro’s metal drawers stops contents sliding around when the van is on the road and ensures that everything reaches its destination in good order. Underneath the writing board drawer is a standard, deeper drawer that can be fitted with metal dividers to arrange space as needed. 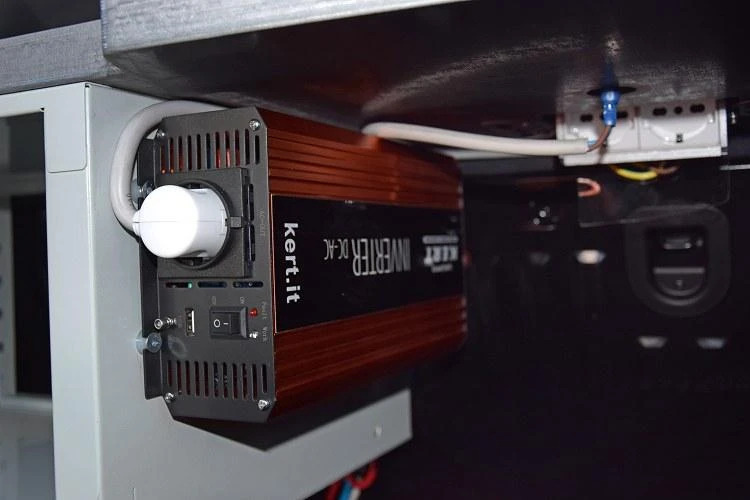 A 50 Ah auxiliary battery has been installed in the gap between the drawer cabinet and the floor of the boot and a 1000 W, pure sine wave inverter with built-in battery discharge protection is secured to the side of the cabinet. 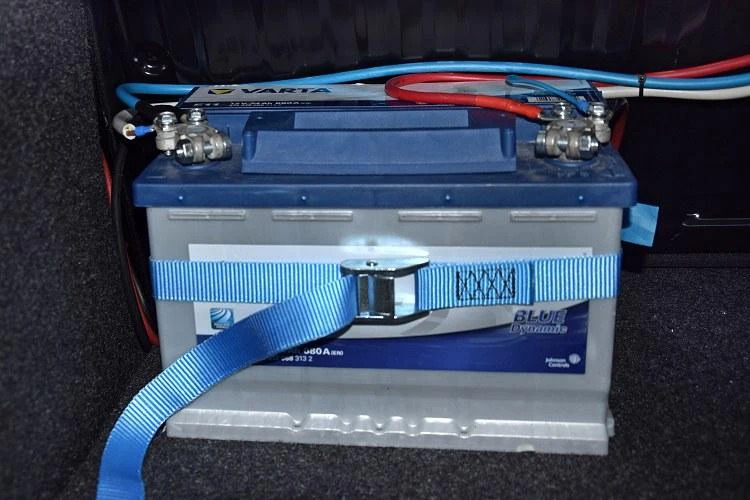 The auxiliary battery is held in place by a lashing strap and buckle. The availability of an inverter-stabilised power supply allows the officers using the van to run small items of electrical equipment like mobile radios, computers and battery chargers etc. without damaging the auxiliary battery or running down the vehicle’s own battery. The sockets powered by the inverter are located in the metal desktop above the drawer cabinet, and fold down flush with the surface when not needed to maximise usable space. The drawer cabinet occupies just over half the width of the boot area, leaving plenty of room for other small items of cargo.